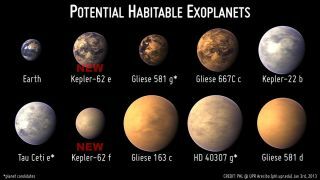 Artist depictions of so-called “habitable exoplanets” are not precise portrayals of what the planet looks like, but are best-guesses based on available data. The "most Earthlike exoplanet" rankings will have to be revised. Today (April 17), astronomers announced the discovery of Kepler-186f, the first truly Earth-size alien planet ever found in a star's "habitable zone" — that just-right range of distances where liquid water could exist on a world's surface. The habitable zone around stars is a so-called Goldilocks' zone where conditions are just right for liquid water. See how habitable zones work in this Space.com infographic. This "super-Earth" is at least 3.9 times more massive than our own planet. It orbits the red dwarf Gliese 667C, which is part of a three-star system that lies 22 light-years away, in the constellation Scorpius. Gliese 667Cc completes one lap around its parent star every 28 days. The planet has one confirmed neighbor, a world called Gliese 667Cb. But astronomers have spotted five additional planet candidates orbiting the star as well. As its name suggests, Kepler-62e was discovered by NASA's Kepler space telescope. About 1.6 times more massive than Earth, the planet lies about 1,200 light-years away, in the constellation Lyra. It completes one lap around its parent red dwarf every 122 days. Kepler-62e is one of five planets known to orbit the star Kepler-62. Researchers think Kepler-62e and its potentially habitable neighbor, Kepler-62f, are "water worlds" — warm places mostly or completely covered by liquid water. Another Kepler find, Kepler-283c is about 1.8 times bigger than Earth and completes one orbit every 93 days. The planet is one of two worlds known to circle the star Kepler-283, which is just over half as wide as Earth's sun. The other planet in the system, Kepler-283b, lies much closer to the star and is thus probably too hot to host life.. This planet is the outermost of five confirmed worlds circling Kepler-296, a star that's about half the size of Earth's sun and 5 percent as bright. At 1.8 times the size of Earth, this planet completes one orbit every 63 days. Kepler-296f is one of 715 confirmed planets just announced in February by the Kepler mission team. The spacecraft has spotted 3,845 potential planets, with 961 confirmed by follow-up observations or analysis. Mission officials expect that about 90 percent of Kepler's detections will turn out to be the real deal.